Luton Town have the opportunity to set a new club record this afternoon by going a momentous 20 Football League games unbeaten. 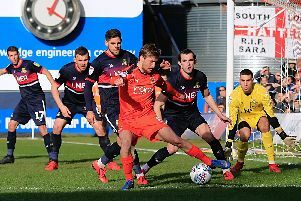 The Hatters’ 3-0 victory over Wycombe Wanderers on Saturday made it 19 matches since they were last defeated, beaten 3-2 at Barnsley on October 13. Since then, Town have won 15 and drawn four to equal a sequence set twice in the late 1960s. Joey Barton’s Fleetwood side now stand in their way, as interim boss Mick Harford said: “It’s a nice position to be in, we will make the players aware of that. “We will go there positive and we will be going there looking for a victory. “They had a good result, so they’re in a bit of form, on a good run. I saw them a couple of weeks ago down at Wimbledon and they fully deserved to win that game. “They’re another tough test ahead, there’s no easy test in the up and coming months towards the end of the season. “As I’ve said, this club has had some great players, had some great teams and to actually equal it was a magnificent achievement. "To go past it would be something special and fully deserved from the group of players, as they’ve embraced everything that’s been thrown at them. "They love a challenge and they’re desperate to do well for the football club. Luton's players won't be placing a huge amount of significance on breaking new ground for the club, as midfielder Alan McCormack said: "It's the longest run I’ve ever been on and every player is probably the same, they’re rewards for what you do on a Saturday week in week out. "Consistency levels have certainly been excellent over the last 19 games now, so if it does happen, it happens, great. "But if it doesn’t happen, it’s one game, just another game ticked off. "We want to win every game, we want to get promoted as quick as we can and as well as we can, doing it the right way, the Luton Town style of play." Striker James Collins, who scored his 19th of the season and ninth in seven games on Saturday, continued: "We don’t think about the records, the records come with good performances and we know if we keep putting in good performances then the results and records follow that on. “When we go on the pitch we just want to work hard for each other, play our football and we know we’ll win games and the record comes after that. “Even if the record wasn’t there, going away to a team like Fleetwood top of the league, we want to win every game. "We know it’s going to be difficult, they’re a very good side and they made it difficult for us here as well, but we’re going to get a good week and go up there full of confidence. “We don’t fear anyone, we’re in this league on merit. "We got promoted last year and we’re here mixing it with some great football clubs and this is also a fantastic football club. However, Collins was proud to have started all 19 of the league games that have seen Town equal such a long-standing record. He said: “To be a part of that is a real honour. “To be part of a side that’s gone 19 games unbeaten in any league is brilliant. “I think everyone in that dressing room, even the lads who are injured at the minute, everyone takes credit for that. “We’re all in it together and the gaffer (Nathan Jones before he left, he was part of that as well. Striker Jason Cummings, who played a cameo at the weekend, added: “One game, 10 minutes I had a part in it, so I’ll take that!